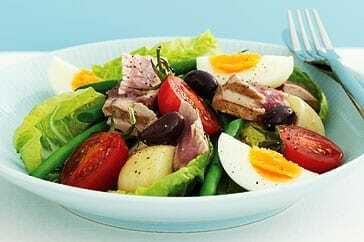 The classic Tuna Nicoise Salad Recipe seems harmless, but the truth is, it’s often drowning in fat and excess calories. This Weight Watchers Tuna Salad Recipe has been dramatically lightened up, simply by creating a different dressing with chicken broth vinegar and mustard, and just a touch of oil. It’s light, delicious and incredibly easy to make. Plus, with so much protein and fiber, this Weight Watchers salad is very filling and makes a wonderful Momentum Plan Recipe to add to your collection. It’s a perfect healthy lunch salad recipe that will fill you up, but still let you feel like you are indulging in a fancy, gourmet salad! Place potatoes in a large saucepan and pour in enough water to cover them by 2 inches. Set pan over high heat and bring water to a boil; reduce heat to medium and simmer 6 minutes. Add green beans and cook until potatoes are fork-tender and green beans are crisp-tender, about 1 to 2 minutes more; drain and transfer all vegetables to a large bowl. Meanwhile, in a small bowl, whisk together broth, thyme, basil, oregano, vinegar, mustard and oil; season to taste with salt and pepper. Add half of dressing to potatoes and green beans; toss to coat. Place 2 lettuce leaves on each of 4 plates. Top each with 1/4 of potato-green bean mixture, 1 1/2 ounces of tuna, 1/2 tablespoon of capers, 1/2 an egg, 1/4 of the red onion, 1/4 of the tomato and 4 olive halves. Drizzle each with 1/4 of remaining dressing. Recipe makes 4 servings.